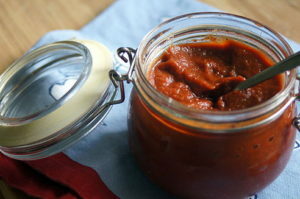 So, what makes probiotic and lacto-fermented ketchup so good? For starters, you can put your own spices in it. I like things to be a bit more zesty and put a dash (or two) of cayenne pepper in my ketchup. So. Good. And even better when used for meatloaf. Or tossed in spaghetti sauce. Or as a BBQ base. Or as a cocktail sauce base. Or fry up some of my Fermented Red Potatoes with some Fermented Garlic and onion and top with ketchup. Or as a dipping sauce for my Adobo Sweet Potato Fries. Heaven forbid we serve it with some Liver Burgers (they taste like venison). I’m getting hungry just thinking about it. It’s not overly sweet. I emphatically dislike ketchup brands that seem like you’re munching on a sugar cube. This ketchup is tangy. The bacteria feast on the maple syrup, making it lower-glycemic than most ketchup. So, yes. The recipe does call for a lot of sugar… but it’s not for you, it’s for the bugs. It’s full of probiotic goodness. If I’m going to eat something, it might as well taste absolutely FANTASTIC and be healthy! There’s millions of healthy little buggies that aid in digestion in this stuff. Pour into a clean glass jar, wipe seal and any extra “mess” and seal. Move to the fridge and let it sit for another week. It should smell like ketchup and taste tangy. If it smells off or has grown any mold, pitch it immediately. Stores in the fridge for three to four months.